ABOUT AN HOUR outside of Jasper, as I was settling into my private cabin on the train, a moose appeared outside my window, as if stationed there on purpose by the Via Rail company. There he stood in all his lumpy majesty alone, a dark figure silhouetted against a golden field. In the distance, the tips of the Rocky Mountains were lit up by the last rays of the sun. It was the most Canadian of moments and I froze in a kind of northern induced rapture. A second or two later and we had moved on, inexorably pushing forward across the Canadian landscape. The Canadian is so iconic that it’s pictured on the back of the Canadian $10 bill. The Canadian has been serving up moments like these since April 25, 1955, when the Canadian Pacific railway inaugurated its new stainless steel, scenic-domed transcontinental passenger trains to traverse the 4,446 kilometres between Vancouver and Toronto. An American train aficionado I met on The Canadian, Tom from New Jersey, told me it’s his favourite train in Canada, and one of the two best in North America in terms of food, amenities and the epic-ness of the journey. Tom was travelling aboard The Canadian for the third time this year. He has forgotten how many times he’s taken it in total, but he remembers the first time: 1957. And yes, this did happen several times over the course of four days on the train. And yes, it was wonderful. The last two cars on The Canadian, at sunset. I felt I was not only transported across the breadth of Canada, but also back in time, to a more relaxed pace of life. If the train survives the 20th century, it will own the 21st. The Canadian starts from Vancouver two or three times per week, depending on the season, at about dinner time. We pulled out as the sun was just beginning to start a long descent over the big Canadian sky. There was a sense of palpable excitement among the passengers. 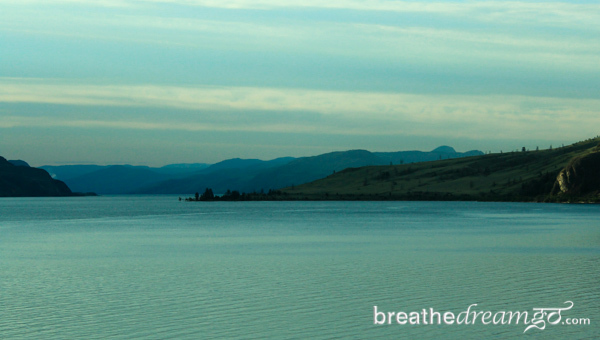 For many, including myself, this journey was a dream trip, a trip-of-a-lifetime. The dining car on The Canadian. Via Rail, the company that’s been running The Canadian since the 1970s, is well aware that this is a big trip, across a big country. They support the excitement and anticipation in so many ways, from announcements about passing landmarks through on-board activities and superb menu options. 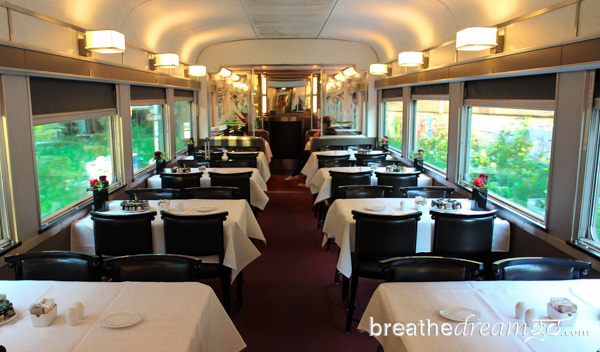 We ate our first meal in the dining car that evening as we left Vancouver. I had halibut, cooked to order without breading, vegetables, salad, a gluten-free chocolate mousse dessert and peppermint tea. I was seated with jovial Emma from Britain, a lawyer turned exuberant tourist. We talked for a long time, over several cups of tea, about many things, some surprisingly candid. Travel talk is like that, it throws strangers together for brief intimate moments. My room-with-a-view aboard The Canadian. In the meantime, the attendant had lowered the bed in my room, tucking away the chairs underneath, and leaving me a shower kit with soap and towels and a single chocolate on the turned-down bed. I retired to my private room, nothing else to do but crawl into bed and read, everything I needed within arm’s length distance. I slept very soundly in a surprisingly comfortable bed, rocked to sleep by the motion of the train. 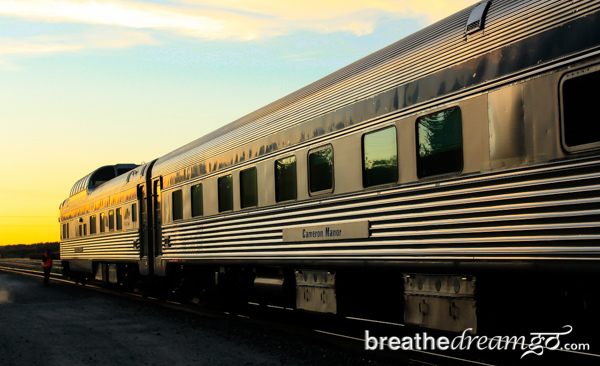 The train is a relaxed way to see the breadth of the Canadian geographic experience. I expected the diverse scenery we passed to be a highlight of the journey. But what I didn’t expect is that the culture inside the train is even more absorbing than the passing scenery. View from the train in British Columbia. Train travel is civilized. It allows travellers to eat and talk together. There is time for a drink before dinner. Time to read a newspaper. And, most of all, time to get to know the other passengers and crew. I got to know several other single passengers on the train, like Tom, the 74-year-old train nerd, who taught us to talk like tough guys from New Jersey. And Emma from Britain, seeing Canada for the first time, and entertaining us with wildly diverse talents like palmistry and African-folk singing. Steve, a music-loving engineer from Edmonton, was our ring leader, who led Emma in a demonstration of the Bee Dance when we stepped down for a few minutes at one of the station stops. Steve, Emma, Tom and me — the singles — all gravitated towards the Park Car, the last car on the train, because it afforded the most social contact. Ours was named after Yoho Provincial Park in British Columbia. In the Park Car, all the comfy club chairs face each other, with windows all around and out the back. 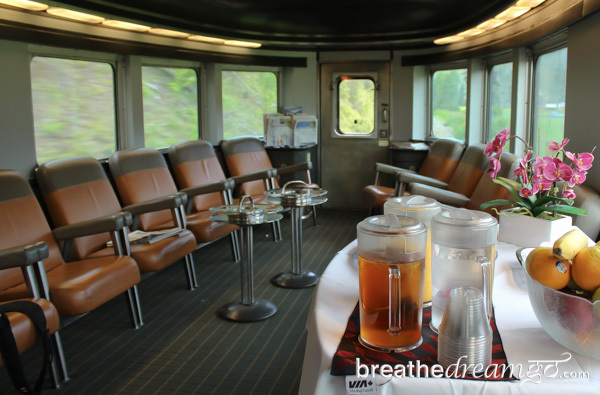 You can drink tea, or gin-and-tonic, talk, laugh and watch the train tracks out the back window. The Park Car on The Canadian. At meals, we singles all started arranging to sit together, sometimes thwarting the mysterious algorithm the dining staff used to seat people. The food on The Canadian is better than you will find on most trains because it is cooked fresh, to order, in a compact but efficient kitchen. Breakfast on The Canadian is made to order. Meal times are the main events around which the daily routine seems to revolve. Each day, passengers are given the choice of first or second (or sometimes third) seating. But there are other diverting activities arranged, usually taking place in one of the activity cars. These cars are outfitted with tables and they offer games and videos for kids and things like wine and beer tastings for adults. The cars are manned by personable activity coordinators who are there to keep passengers entertained and briefed on all aspects of the train, the itinerary and the passing landmarks. Dave Gunn demonstrates his model train building in the activity car. The Canadian also hosts a kind of Visiting Artist program. A train model builder from New Brunswick, Dave Gunn, set up in the activity car to demonstrate his techniques and show photos of the 40-foot-square “layout” he’s built in his home. Dave’s layout, designed to look like a small town in 1950s Canada, is the most ambitious train set I’ve ever seen. Not only does Dave, a retired engineer, make all the buildings, he even builds some of the locomotives, too. 4,466 kilometres to catch your breath: In the space of four days, you’ll get to see the lush boreal forest, the lakes in Northern Ontario, the western Prairies, and the magnificent Rocky Mountains. On board The Canadian, you’ll discover the beauty of Canada’s landscape and cities at a pace that allows you to be in-tune with the nature around you. Even with so much to do on the train, there were times when the beauty of the landscape sent me running up to the Panorama car to take photos. This was especially true about halfway through the first day when the train started to wend its way through the foothills of the Rocky Mountains. The outside scenery shifted to became the focus of attention. 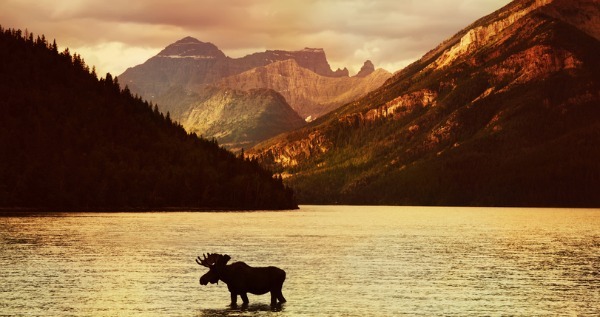 Jagged mountains, dark green forests and the chance to see wildlife — bear, elk, moose and deer — captured the attention of most of the passengers. Pyramid Falls was a highlight, and the train both announced their appearance and slowed down to let us take them in. As we approached Mount Robson, the highest point in the Canadian Rockies , we were told by the activity coordinator that the summit rarely appears; it is usually hidden by mist and clouds. Our anticipation was high and we were thrilled by the rare sight of the handsome peak. 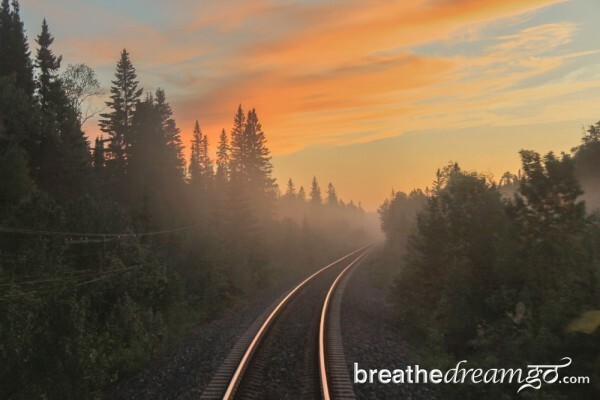 The staggering line of Rocky Mountains, the flat wheat fields of Saskatchewan, the forest-hemmed lakes of Ontario — so much of Canada’s natural beauty paraded past us as we relaxed on the train. Last sunset on The Canadian. By the time we arrived in my home town, and caught sight of the CN Tower, Toronto’s punctuation mark, I felt I had lived an epic journey. We drank ice wine in the Park Car to celebrate as we watched the last of the 4,466 kilometres of track unroll behind us. We all knew we had been through something special together. This is the best way to see Canada that I know. The Canadian offers passengers several classes of service, from economy seating to cabins with private toilets. Check the Via Rail website for more information. All Sleeper Plus Class passengers are entitled to use of the activity cars, panorama cars, Park cars and the dining car. Three meals per day in the dining car is included in the fare. Snacks, tea and coffee are available all day in the activity cars and park cars, at no charge. Alcoholic beverages are extra. Showers are available, but not private. Be prepared to spend most of the journey, which is almost four days, aboard the train. There are only a few stops where you can get off the train, and most of these are just for a few minutes. If the train is running on time, you can get off for an hour or more at Jasper and in Winnipeg. However, the train is often delayed, sometimes by several hours, because it has to stop regularly and let freight trains pass. WiFi is only available at station stops, so bring a book or two!